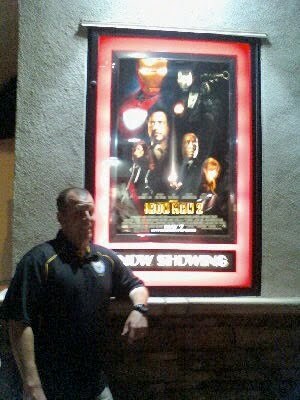 Jeremy and I snuck out one Thursday evening to go see Iron Man 2. It was the first time we'd done anything spontaneous in years - and it felt great! We were like 2 kids in a candy store giddy and tickled pink to be out on a weeknight. We were both big fans of the first movie, Iron Man 1. We are suckers for big budget movies that are action packed with a star studded cast, some humor, and a bit of romance. This movie fit the bill perfectly. Robert Downey Jr., Gwyneth Paltrow, and Scarlett Johansson, Samuel L. Jackson and even Paul Bettany (in a small role) were great! They delivered solid performances and entertained us well. We are still on the fence about Don Cheadle. Yes, he is a fabulous actor. Yes, we thought he was excellent in Ocean's 11, 12 & 13. We like him. We do. He just wasn't Terrence Howard that played Rhody in the first movie. It feels like Holllywood was trying to pull a fast one on us. And we don't appreciate that! The big bad evil guy was played by Mickey Rourke. He had a great screen presence. He was the ultimate comic book villain with a cool older guy rocker image. We were fully entertained and pleased with this movie. Jeremy liked it so much that he took our boys to see it the next week! Here's an interesting tid bit that happened during the last 5 minutes of the movie: the last action scene is taking place, the tension is building, the windows on the screen are breaking, the theater is shaking with all the crashing and booming sounds, and all of a sudden a light bulb in the theater comes crashing down on the floor in front of us. Yes, a REAL LIGHT BULB fell out of the ceiling and burst into a thousand pieces just in front of the front row seats. The movie was so intense that it shook the light loose! Ha! After the movie finished Jeremy went down front to survey the scene and picked up the biggest piece to take to the manager. The workers were as shocked as we were! No, we didn't get any free tickets or concessions for bringing this matter to their attention, but we did get a good story out of it! So, here's our recommendation... If you liked Iron Man 1 then you will most definitely like Iron Man 2. Go see it. Go to the full price theater or wait until it's at the $3. Or rent it when it comes out on DVD. Any way you see it you will like it! We give it 4 1/2 drones out of 5.